Have you ever wanted to tour Europe in a Motorhome, but it just seems too daunting. All those rules, the tolls, the language barrier and the parking- are they called Aires, Stellplatz or Sostas? How do people even find these places and why can't you book them in advance? And don't even start with the free/ wild camping. It's just too terrifying and complicated! I completely understand how you feel. Heck, last year it was ME who was saying/ thinking/ panicking about all this stuff. But between now and then we've travelled 17,000 miles in our motorhome and visited 11 countries. In our first year of Motorhome life, we've learnt a thing or two- mostly by error! – and the fact is that it's just not as scary as it seems. I promise. Today I'll walk you through the various steps you need to take and, hopefully, you'll feel much more confident by the end of it. How to Tour Europe in a Motorhome- POWER! So, you've bought a motorhome. You've packed, adjusted and repacked your motorhome. You might have even spent a few nights away. Or maybe you're renting a motorhome for the very first time so you can explore Europe. Whatever your plans are- here's everything you need to know to start your adventure and keep your life running smoothly. If you'd like some more general guidance on road trips and motorhome travel, we have some fantastic guides and checklists to help you get started in our FREE RESOURCE LIBRARY- click here to check them out! We installed a wifi dongle into our van and, quite seriously, it's BRILLIANT. We've travelled all around Western Europe and it hasn't let us down once. Oh ok, it's failed to get a signal just once and we were parked on the top of a mountain in the Swiss Alps at the time- I'm not sure I can blame EE for that!! You can buy Prepaid SIM cards full of EE data from Amazon as well, or take out a monthly contract direct with EE which is what we did as we use it so often. We regularly have 6/7 devices connected to it at once. Yes, occasionally it's a slow connection and if you're used to fibre broadband it's going to seem REALLLLLLY slow at first, but for ease, convenience and power we haven't found anything to beat it. We charge it using a 12v charger as we drive and it easily lasts a couple of days when we're wild camping. It's so good we've bought another one to use on our boat! UPDATE: It appears the little yellow box is being discontinued (boo!) but the black one (see below) is the newer version of exactly the same thing, so we expect it to be just as good. When you use Co-Pilot, you put your height, length and width into it (we prefer to add a little extra to each measurement, just to be sure!) Copilot then creates a route for you, which avoids any roads you can't fit down. In the year we've used it and all the miles we've done, it's only been wrong twice. Both times it tried to send us down TINY lanes which were way too small for our motorhome. And both times we refused, turned around and it found us another route. We believe that the roads were so small and local that they hadn't been properly measured or submitted to the mapping company. One of these roads was in Wales, and one was in Germany- so don't rely entirely on the sat-nav, keep an eye out for road signs and restrictions as well. I also use my personal iPad or phone to find us an alternative route should we hit a traffic jam- both of those have ‘traffic' setting enabled on them so we can see where the traffic is and how to get around it. Some of our best exploring is done this way as I navigate us down tiny country lanes in the middle of nowhere- after all, it's not a proper adventure unless there's grass growing in the middle of the road! Also, be careful where you mount your sat nav. Many countries now say its illegal to have the satnav mounted on the windscreen or blocking the driver's view. We use this mount and mount our ipad on our dashboard, where it's low enough to not cause any problems. One of the joys of touring Europe in a Motorhome is the freedom that you can find on the continent which you just can't get in the UK. There's so much SPACE and so many pretty places to pull in for free and camp for the night. It's a joy to travel over there- but that joy gets lost if you need to find a proper campsite with electricity every single night in order to keep everything going. The solution to this is an invertor and possibly a power pack, depending on how power hungry you are. We are VERY power hungry- we have three laptops, three iPads (4 with the sat nav!) and 6 phones! (Don't ask!! Yes, I know there are only 3 of us!!) We charge as much as we possibly can whilst we travel, including the laptops. We do this by running the invertor as we drive. We added a 2-plug extension lead and that allows Jade and me to charge our laptops on a drive without needing to use our precious battery life when we're camped. We fitted and love this invertor but there are many other options out there if you need a different size/ power output. Whilst we're on the subject of power, both Jade and I have long hair. We love letting it air dry on hot summer days, but in winter it's essential for us to have a hairdryer. Believe it or not, we actually carry TWO hairdryers onboard. Oh yes. One is a good, powerful but lowish wattage one we use when we have electric hookup, and the other is a 12v one, which plugs into a cigarette lighter socket in the cab. Honestly, it's not the best hairdryer we've ever tried, but it's the best I found- and I've trialled 4 different versions! Be careful of overheating- especially if you have long, thick hair like us which takes a long time to dry. You might need to give the poor hairdryer a break! But it's still better than nothing if you plan to tour in colder areas throughout the year. Ok, I didn't want one of these. I really didn't want to be THAT motorhome with the generator going all evening, ruining everyone else's peace and quiet. But, as Mr WB said, if we're going to camp in the middle of nowhere for days at a time, we need an alternative power source ‘just in case'. We've agreed that we will NEVER use it except in an emergency or for servicing, and we did a lot of research to find the best one for us in terms of noise levels and size. I have to say we're really pleased with this one from Clarke. It's small enough to fit in a tiny cupboard under our seats and I can lift it with one hand. We've never used it in an emergency, but we did crank it up when we were wild camping on a river bed in Austria and it's not as noisy as I expected. When we were sitting inside the van and it was outside, it didn't stop us talking at a normal level at all. 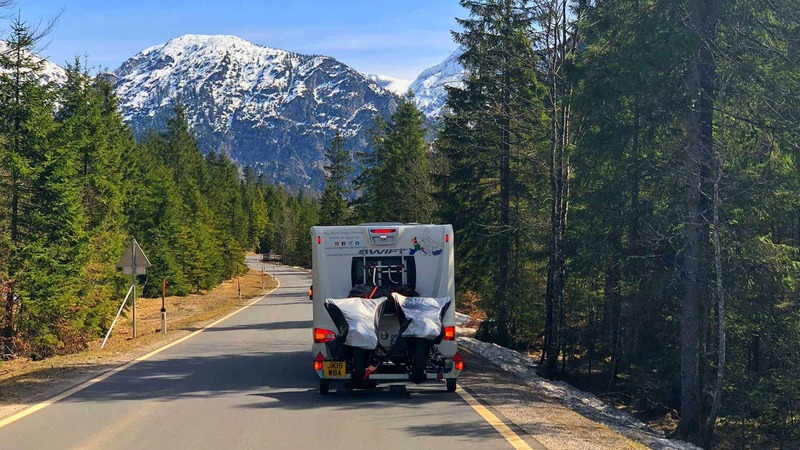 How to Tour Europe in a Motorhome- us wild camping in Austria! We do have a solar panel onboard- we fitted it in February in the dark when it was about -4 degrees!! There are lights on and it appears to be working, but we have no idea how much power we're getting until we use it over the summer. We'll report back with more detailed info then. To combat that ever happening again (we hope!! ), we fitted the Gaslow refillable bottles. These went easily into our existing gas locker and we were able to fit them ourselves. We used them for the first time last week and we're really happy with them. Filling took a little while to figure out- turns out you need to TWIST the nozzle clockwise, but so far, so good! Time will tell- I'll write a full review after we've used the system for a while longer. This is the question I get asked the most on Facebook (talking of which, are you following me on Facebook?? You should- we have a lot of fun over there! Here's the link: WANDERING BIRD FACEBOOK PAGE ) But the biggest question most people ask when they're planning how to tour Europe in a motorhome is how do we figure out where to stay??! Put in the area you are heading for into Park4night and select your campsite options. I tend to always use the ‘Map' feature, although be warned- when you first zoom in towards your area it can look a little overwhelming when all the sites pop up!! Learn the different symbols. A tent means full-on campsite and is generally a more expensive option. Red motorhome is paid Aire, anything from 1€ upwards, green Motorhome is supposed to be free aire- but we often find that there is a cost involved with them too. Anything with a motorhome symbol is approved motorhome parking area and we try to head for those to ensure we don't break any local laws. However, be aware that of course local laws can change- be alert for signs when you pull into the parking spot. There are also ‘fir trees', which are wild (free) camping spots. Many of these are gorgeous and well out of the way, so if you find a nice one on the app don't be put off- it's well worth checking out. Next, look at the pictures of the spot. We avoid any place that doesn't have a picture as you can't see what it's like or if we'll be able to park there (remember with a trailer we are over 9m long! If you're smaller you don't need to worry about that so much and you'll have a much wider selection. Start to look at the comments. Many of these will be in a foreign language, but use Google translate until you start to get an understanding of basic words. I don't always go by the star rating alone, but if its low, I'll certainly look at it more closely. Anything which mentions boy racers, noise or bad behaviour we avoid. However, many people seem to leave a low star rating but their review is really good- so go more by the words than by the star rating. Check to make sure it's open! A lot of places close between Oct- Apr. Then I tend to go on gut feel. I might have two or three options at this point but if I'm honest I'll know which one of those three I like the idea of most, and that's the one we head for first. If we get there and its full/ closed/ turned into a building site (has happened twice to us!!) then we have other options we can fall back on and we can head to those next. We use Park4night as it tends to have the most options for places to stay in Europe. However, there are some other good choices too. How to Tour Europe in a Motorhome- use apps to find some incredible places to stay! This site works in a very similar way to Park4night, however, the BIG thing it offers which we love is you can remove all parking spaces which aren't suitable for longer motorhomes. To the left as you search is a ‘minimum length' setting, which you can use to filter out all the smaller spaces. We love this feature when we are travelling to a more built-up area and want to make absolutely sure it's suitable for a longer vehicle. Search for sites is again similar – it's like the UK version of Park4night (which I believe is French but all the settings have English options). We use Search for Sites ALL the time in the UK, but less when we travel in Europe. Again, it's a really useful site and well worth checking as occasionally there are different places on here than on the other two. Pretty much all the reviews on here seem to be in English, which can help when you want to read what people thought! Between the three of them, we've travelled around Europe without any problems. Once, in Italy in August, our preferred Aire was full, so we had to move on elsewhere and a few times the place we've been heading for no longer exists! If you find one of these, please take the time to update the app so other motorhomers don't do the same thing. They are all great, FREE resources and without them touring Europe wouldn't be nearly so easy. Don't panic– Europe is EASY to travel & explore compared to the UK. There is so much space and so many options- don't forget that motorhomers in Europe can go ANYWHERE- they don't all head for Cornwall or the beach- so there's loads of room for all of us to enjoy! 🙂 And Motorhomers in Europe are not treated like a nuisance- most towns make excellent provision for them and you can stay in clean, pretty locations within walking distance of town centres or attractions. These places are called Aires/ Sostas/ Stellplatz. There are many different rules and different stories about this. For example, wild camping is illegal in Italy. Yes, that's true- but the Sostas cost from as little as 2€/night, so why would you worry? And most of the Sostas are spacious, with beautiful views and only a handful of parking spaces. Wild camping is also illegal in Switzerland- until you reach the Alps and people are merrily parking for free in any layby they can find. My favourite night of our entire trip was spent in the Swiss mountains, looking up at the Milky Way, with nothing but the wolves for company. And it cost us absolutely NOTHING!! Yep, that's us and the Milky Way, hanging out together in Switzerland. So my advice is to check out the legalities in the country you are heading for, and then check out Park4night. Usually, if there are ‘wild' camping spots listed, they've been tested and were safe to camp in, although some people seem happy to park somewhere even if it says ‘No Overnight Parking'- we don't like to do that. If you're not sure and not happy, move on to an approved Motorhome stop point, so you can get a good nights sleep without worrying about being woken up for parking illegally. 112 can be dialled anywhere in Europe in an emergency, accident or distress situation. We have been lucky to have never been the target of theft, but it does happen. Most of these thefts are opportunistic- if you leave something outside unattended there's a chance it will be taken- just like in the UK. Also, if you park in busy, built-up areas, there is more chance of ‘unsavoury types' spotting the van and taking their chances- just like in the UK. We strongly believe that touring in your motorhome is no more dangerous than touring in the UK, but common sense should be used. Carry a baseball bat and ball. According to a lawyer (who reads this blog- thanks for your input), if you just carry the bat it's bad. If it's the “closest thing to hand in the heat of the moment and you were carrying it on board because you like to play the game”, then it's not bad. But you need to carry a ball too in order for that to work. We have a safe space on our van for paperwork and other things we don't want people to get at easily. We don't carry a lot of jewellery with us and in fact, I don't wear my rings hardly at all whilst we're travelling. We've also taken some extra security measures- you'll forgive me if I don't go into great detail, but find somewhere safe on your van where anyone who has broken in and looking for something quick to steal might not look. We think it's sensible to carry a spare set of keys for the motorhome with us. We hope we will never need them, but a spare set is going to be completely useless sitting back in the UK. So we decided to bring them with us and keep them well out of the way. Using a phone whilst driving is illegal in many countries. It is also illegal in some countries (such as France) to use a headset with an earbud whilst driving, even if it's just to listen to music. Travelling Europe by Motorhome- and staying in some stunning places! Nobody likes this bit, because it's pretty boring, but it's also essential. We've been stopped twice, both times in France and both times near the ferry at Caen. The police seem to love waiting there and pouncing on Motorhomers and caravanners who might just have forgotten something. They expect the fines paid in cash on the spot, or else you'll be escorted to the nearest police station- not the most welcoming start to your holiday! However, if you have all the following, there's nothing they can do except wish you a ‘bonne journee' and see you on your merry way. You need Insurance for your motorhome which covers travel in Europe (and other places like Morocco if you're planning to venture further afield). You also might want to get Breakdown cover which includes recovery to Home- just in case the worst happens. Bring your original certificate with you. Europe doesn't have an NHS in the way that we do, and without insurance, you will need to pay for any treatment or medical care you receive. Make sure you read the conditions carefully- many ‘cheap' policies don't cover you for more than a week or two at a time, so if you're planning on going away for longer you'll need to find an appropriate insurer. Ideally get repatriation to the UK- just in case. If the vehicle is company-owned, hired or leased, you need a letter from the company stating their permission for the vehicle to go to Europe. First aid kit– did you know it is illegal to NOT stop at an accident in France and many other places in Europe? Hi-vis jacket which must be easily reached without leaving the vehicle (or getting off a motorbike!) We recommend carrying at least 2, ideally one per person. Radar detectors are forbidden EVERYWHERE in Europe. Daytime lights MUST be switched on for Motorbikes at ALL times in all conditions in ALL countries. Ours are wired so they automatically come on with the engine- saves us forgetting! On-the-spot fines are common in all countries, although in Ireland the Police are not authorised to collect fines. Some places, like Croatia, give you 8 days to pay. Other places, such as Portugal, equip their police officers with an ATM to ensure fines are paid immediately!! Be careful of low-emission zones and areas which require a congestion charge or something similar, such as Paris and London. These places are often clearly signed but it can be worth Googling requirements before you visit an area. Also, don't forget you need a Vignette for Motorways/ toll roads in Switzerland and Austria. For a complete list of rules in each country, here's the AA again. We LOVE this pass. Oh, it's sooooooo satisfying being able to sweep past all the huge queues at some of the tolls and go through the automated toll pass lane in France. It also works in Spain & Portugal. The best bit for us is not having to worry to find the change at each toll- it just sends you a bill at the end of the month which is paid automatically by Direct Debit so its one less thing we need to worry about! We bought ours at Sanef Tolling, although they have now changed their name to Emovis-tag. Make sure you're carrying enough Medication for you and any pets you have. We always carry a little more than necessary- just in case! Be prepared to explain your medication and prove what it is with a doctor's note or something similar- just in case customs question you. Try and get your Euros in advance as you'll get a better rate than if you use the ferry/ tunnel. You can get money out of cash machines abroad- but, of course, there are charges for that. We use Travelex but there are loads of different options for you to choose from. Also, don't forget that not every country in Europe uses Euros. Here are some popular ones which might catch you out! There are others in the East as well- make sure you check in advance- but nearly everywhere has a cash machine so you can always get money out if you need to. If you are planning to tour Europe in a motorhome in the Winter, think about your tyres and snow chains. It's compulsory in most countries with Mountains (France, Germany etc) to have winter tyres fitted and to carry snow chains which will fit onto your tyres. This is usually enforced between 01 November and 15 April. This list by the AA gives a great guide for you. Phew!!! There is a LOT of information in this post- and at first glance it can be overwhelming. None of it is ‘difficult', but it will take up a bit of your time as you get it all organised. Here are some final tips to help you make the most of your big adventure!! Driving on the right is not as terrifying as it seems! Don't forget- all the roads are set up for it- you don't have to remember to go around the roundabout the wrong way- it naturally happens as that's the way the road system works. Don't forget some (very, VERY few) roundabouts in France still give priority to people coming ON to the roundabout- so if you're already going around you have to stop and let them on! (Don't ask- it's France!!) In all our years of driving in France with a car and a Motorhome, we have NEVER found one of these roundabouts, but there have been a couple of times when a member of the ….errr… ‘older' generation has merrily driven onto the roundabout assuming he has right of way. (I hate to say it- but it does seem to be the men who do this!!) Just be careful and pay attention if you're not sure. Better to slow down and let them go rather than crash to prove a point! Learn a little of the language. In France, Germany, Belgium and Holland, English is widely spoken, but they love it if you make an effort. After all- you are in their country and if you show a little respect to them they will really help you when you need it. Accept that you are a tourist- you will make mistakes and probably look like an idiot. But that's part of the fun of travelling! Learn to ‘slow travel'- travelling by van is about the journey as much as the destination. This can be hard when you're on a tight schedule, but try not to overbook your time so much that you can't relax a little or explore random things that you find along the way- like an ice cave we randomly found in France…??!! Having said that, do a little research as you travel so you don't miss some amazing places. We like to pick an area and then Google it to see what great adventures are waiting for us! I hope you have the BEST adventures- be sure to tag me in your posts and show me where you end up! Let me know what you think of the guide in the comments below- I'd love to hear your thoughts. You’re very welcome! Hope it helps with your upcoming adventures!! When you were wild/free camping, did people have much camping stuff out in the off-season? As we’re going to be in a fifth wheel it’ll be a bit cramped if we can’t push a slide or two out! People happily sit outside and enjoy a campfire and dinner, but don’t get awnings and things out when they’re wild camping. Those places are more designed to be a one night stop. I think you’ll be fine with the slides, though I admit we haven’t seen any fifth wheels on our travels- you’ll probably have loads of people wanting to come and have a look inside!! 🙂 I think as long as it looks like you’re not planning to stop for a week, you’ll be fine. Of course, if you end up somewhere really remote,you won’t have a problem as no one will see!! We are from Port Elizabeth, South Africa. My family (me, wife two kids 11, 9) will be hiring a camper for 20 days in December in Munich and plan to drive the black forest route and down to Rome via Switzerland and back to Munich. Do you have any experience of the cold in that time and how hired campers hold up? Will we find sites open that time of the year and do you know if there will be any exciting activities for the kids, with exception of viewing architecture and views? Any other advice? What an exciting adventure you have planned! Funnily enough, we’re going to Munich in December too! 🙂 As you probably guessed, your experience is going to completely depend on the weather and how much snow has fallen so far. You will DEFINITELY need a camper with heating, so make sure your rental has that fitted (you’d be surprised how many don’t!) You will also need snow tyres/ snow chains- even if it hasn’t snowed. This should be provided- but please check. Also, do you know that most hire campers don’t come with bed linen/ towels and sometimes not even pots & pans? It depends entirely on your rental company of course, but it’s something to check. In Germany but what an adventure we had. Munich, Black Forest, rhine falls, Lucerne, Italy all the way to Rome and back up to Venice, finishing in Rome. 3300km. Your advice re the heating was spot on. I can recommend Indie Campers to your readers. They were amazing and friendly. The episode on the parking apps was a game changer. We used Park4night- amazing for piece-of-mind. Come tour South Africa! It’s great here. It’ll blow your mind! No real best time, they are always around but June, July, August is great for Kruger Park (dry season) which is a must do. It’s a huge reserve which requires at least a week or two to properly see. There are many many sanctuaries though, where they have rescued cats and cubs (cheetahs and lions). Good opportunity to cuddle little hand-reared cubs. If you go camper vanning here, and you have the time, I would begin and end in Cape Town. We live in Port Elizabeth which has amazing beaches and lovely world class private game reserves and is the gateway to the garden route which takes you back to Cape Town. I’m presently researching camper hire beacause I haven’t even seen a lot of what I’ve just described to you. I imagine a full round trip would require between 6000 and 10000 km so not for the faint hearted. We drive on the lefthand side (previously a British colony). Van Hire options seem limited (bobocampers, and Maui seem the best) and strangely more expensive than Europe. If we do take on the endeavor, I’ll let you know. Great info, thanks for the effort. Lots of details still for us to consider and heating has now become an important one for me. I assumed the dashboard heater was the only one available and would require you to be driving or idling. What kind of heating is generally available which I should insist upon? Like fuel pellets or gas?…or electric heater to use when plugged in? Most motorhomes have gas heating and this is preferable if possible. If you have electric heating you won’t be able to use it unless you are plugged in at a campsite- and not all campsites with electric will be open at that time of year. The dashboard heating at the front won’t be enough to heat the back so the kids will freeze- and it will be COLD in December. Like, really cold. I assume the rental company has modern (ish) vans, so they should all have heating throughout. Make sure you have the appropriate attachments to be able to refill with gas in the various countries you are going to- each country in Europe seems to need a different attachment!! last week i make a tour of europe and get guideline throgh this channel. that is best way. so here i will recommend to others also that before travel please read this article. Thank you Bella- I’m so pleased to have helped you! How did you enjoy your tour?? Thanks for this Kat – we are traveling from Paris to Rome in October. Our family (2 adults and 2 children who will be 8 and nearly 7) are flying in from Australia and renting a van from Indie campers. We want to stay at the cheaper aires in both France and Italy but we will need power/water, as the van only has 50L of water in it, and we’ll have our iPads and phones to charge and no inverter as we are traveling from overseas, is this possible? Can you suggest in particular? Hi Heather- that sounds fun! You’ll find many aires/ sostas have fresh water available. Also, you can always pull into one during the day to refill, then drive off again. If you’re careful, 50L might last a couple of days- you may want to buy bottled water to drink. You should be able to pick up a cheap 12v phone/ipad charger- maybe from a garage or hardware shop- this should allow you to charge phones etc as you drive- leaving you free to camp wherever you like! Hope that helps! Hi, just a brilliant article for all all first timers. You covered everything that one needs to be aware of and I’m extremely grateful. Thank you. One thing though, what is the ‘approximate’ cost of taking this trip? I maybe missed this, so apologies if this was the case. Best of wishes and happy trails for 2019. Do you have any experience with American style winnebagos over 8m in length and if we could still get around without too much trouble? Hi Devon. I don’t have any personal experience with Winnebagos but we have seen a few whilst touring. You’ll need to be very careful where you stop. Length isn’t an issue (we’re over 9m with our trailer), but width might be a problem at aires and even on some campsites. Also take into account toll costs- if you are over 3m in height it increases the toll costs considerably. Good luck!